This is part of our free, online and highly-praised survival fiction novel. You can read the rest of the parts here. Bob’s shot, buzzed over the men’s heads, and then struck one of the ATV tires. The Misty Lake gang ducked behind two fallen trees as the tire burst. Their heads spun round desperately searching for where the shot came from. The confusion was exactly what Bob had hoped for. The gang had no idea where he had fired from. “Lay down your weapons,” he shouted again. Bob’s ominous voice echoed through the ravine. He casually laid back behind the large boulder and waited. “Lay them on the ground, NOW,” he bellowed from the cliff, then waited for a reply. At first, the men dared not move, each searching the cliff face for the direction the voice came from. They froze and did nothing. Bob inched forward, and carefully aimed his rifle over the rock. He let lose a second round at the other tire. He was angry now. “I said lay your weapons on the ground, and head out.” Two of the four men immediately did as they were told, dropping their weapons at their feet. While the other members of the gang, the ones who operated the chainsaws, now refused to comply. The last two men looked at one another and nodded as if in agreement, they pretended to lay their weapons on the ground, then quickly rolled to a log they thought was between them and the shooter. They began spraying the hillside with automatic gunfire. Wasting two entire magazines of 7.62 bullets from their AK-47s, they tore up the foliage all around Bob, and the boulder. Bob shrunk back behind the rock for cover as dirt and debris flew all around him. No sooner did the east valley gang, (as the Granvilles were calling them now) open fire, then Murphy and Logan let fly a volley of rounds from across the way. The two companions from the adjacent cliff took full advantage of their position high on the hillside. Logan instantly killed the closest man with his first shot. He fell at the edge of the trail with a brutal head wound exposing his skull. The gang member beside him looked at his fallen buddy in horror. Next, one of Murphy’s rounds accidentally hit one of the unarmed men who had been complying with Bob’s orders. The errant shot had ricocheted off a large rock at the edge of the trail and struck the man’s arm just below the elbow. The surviving instigator next to his gunshot buddy, yelled out in horror upon seeing the brains of his friend, “ALL RIGHT, ALL RIGHT, WE GIVE UP,” waving his weapon in the air. He tossed his gun out in front of the log and waited for the shooting to stop. The statement had the desired effect. The group quickly gathered their wounded and the body of their fallen friend. They frantically maneuvered around the stranded ATV on the trail, leaving it behind as it apparently belonged to the dead man. Then the three tore off, reluctantly leaving their discarded weapons where they lay. The three quads revved their engines, spewing a cloud of blue smoke as they blew down the southern trail, and were gone. They made their way down from the cliffs, and collected the weapons left behind, and hid the quad under a brush pile several hundred yards back in the forest, carefully hiding the vehicle’s tracks with dead fall, and debris, then they headed back home. The 2-mile walk to the cabin was somber, each man was lost in his own thoughts. They tried to reconcile the death of the man that had been killed. They realized it was necessary, the gang members would have killed anyone of them if the tables had been turned, yet it was still hard for the men to digest the man’s death. The statement was unnecessary to admit to the group, it was simply Logan’s way of confronting what he had done. The sin of death is a harsh one. Bob knew Logan would have to carry it for the rest of his life. No sane man ever feels right after killing another man. This is what separates us from the mentally unsound. It’s a burden that every combat soldier has to bear by himself. Either they make friends with the event or are forever tortured by it. Most soldiers develop different ways of dealing with this challenge, but all will carry it to their grave. Before the men arrived back at the Granville cabin, a dark cloud had built up over the valley, and it began to rain. It was as if a sign from above had foretold of some bad omen that had transpired on that southern trail that day. The rain tried to wash the blood away like the men tried to wash away the memory of it. They all decided to make no mention of the death to the women and agreed to only tell what was needed. They would simply say they had scared them off. They needed to first process the event for themselves, and if the time came… on that day Logan must tell his girls about it, he would. They rounded the last bend in the trail expecting a hero’s welcome, but found no one at all to greet them. Granville’s small clearing lay silent and empty. There was no sign of the girls anywhere. The rain was coming down in a slight drizzle. Logan’s heart sank as he yelled out in vain for his wife and daughter. He cupped his hands to his mouth, “LYNDA, MARLEE,” and called again and again. He ran to the cabin and burst through the door searching for his family. “Oh Jesus, let them be safe,” he ran back outside. He felt ill as he frantically scanned the tree line for signs of the girls. Bob circled the cabin. His eyes scanning the ground near the door. He walked slowly, watching carefully where he stepped. He headed around the back of the cabin scanning head down, with the other men in tow. He looked up at the woods and entered …following some invisible trail. Their tracks headed North by North-West away from the tiny home. Then they angled straight through a small break of Aspen, and down toward a stand of Spruce, several hundred yards behind the home. Bob yelled back to Logan: “They’re alone… no one followed them …and they were walking… not running.” Logan’s spirits brightened at the news. He quickened his pace. Bob continued the narration of the invisible story that he read from the tracks, “I see no other tracks following them.” He then began to jog. Logan yelled out once again, “Lynda, Marlee,” he called and hurried to catch up to Bob. “Oh let them be alright,” he choked out the words, his face staring skyward. The men slowly followed the trail for three hundred yards or more. Twice Bob lost the trail altogether, and had to double back to start over. The rain was coming down harder now, making it difficult to see the tracks. Logan yelling all along as they followed, “Lynda, Marlee,” with no response. By the time Bob and Murphy caught up to Logan, the family was locked in an embrace sobbing in each other’s arms. Apparently, Lynda had twisted here ankle on a slippery log, and couldn’t stand. Earlier, when the shooting started, Lynda wisely decided to hide in the forest. She had considered the worst might happen. That her husband and their friends may not be able to hold back the men from Misty Lake. So for safety’s sake, she decided Marlee and her would hide in the forest until it was safe to come home. Everyone knew that this was a good plan, but all agreed that next time it would be best as part of the group’s plan, leaving no surprises for Logan’s heart. The family settled down after their embrace, and Bob carefully splinted Lynda’s leg, then they made their way back to the Granville home together. The men revealed what they dared of the earlier event on the southern trail. The women regarded the ambush with horror and were glad everyone was safe. They agreed after hearing the story, that more was needed to secure their valley from further intruders. In any case, it was sure these men would be back for revenge. The women proposed placing “NO TRESPASSING” signs at the trail heads with a message under it, warning the trespassers to keep out with words like “DANGER or DEATH”. They all agreed this may work, and decided it was time to set mantraps along the trail as an added precaution. There was no illusion among the five of them now that these men would come back to try again. They would most likely bring more men next time, and more weapons too. Bob had years of experience making deadfalls for lynx and marten trapping. He had constructed many wooden triggers for these types of traps, and other spring pole devices …but as for man traps. The group would have to improvise. The simplest device was ingenious. Murphy came up with it while considering the sheer number of devices they would need. It was the most lethal too. They were simply made and they used a piece of copper tubing, with a live 7.62 round held firmly at its end. It was necessary to have the rounds in a tube to build up enough pressure when fired to be lethal, as a round fired without a barrel will not have enough pressure to do any harm. Then it was fastened solidly to a tree with bent nails, and fixed with a trigger when ready. The device was then aimed up the trail, and it was fired by a trip wire held under tension, using the leftover fishing line from Murphy’s alarm system at the cabin. The mechanism was wired so as, to release a clothesline spring-clip held under tension, striking a nail behind the percussion cap. This would prove to be the easiest trap to set up. It used only bent nails to fasten it to a tree and was the most effective. It was easy to hide and quick to set up too. The group was able to create fifty of these simple devices and set them all along the trails and pathways that skirted or entered the valley. The men spread hair clippings at each site and periodically urinated by the lethal traps to keep the wild animals from triggering them. Bob had taught the group that whenever an animal smells human scent along a trail, they will almost always stay around the area. He had learned this from his trapping days. It lasts for several weeks, then needs to be renewed. The hair and urine were the most effective to warn the beasts that man had been in the area and to steer clear. Occasionally, it was unavoidable and an animal was accidentally shot by these man-traps. Although this was unfortunate, it simply added to the larder of the residents of the valley. Whenever a shot was heard, usually at night, two of the men would check it out in the morning to make sure it wasn’t human. This way, they could collect the game that had been taken by accident, and divide it up amongst the two groups. Other devices in their arsenal were large pendulum-style log traps, and huge dead-falls that were built out of large trees. The trees were at least a foot in diameter and were designed to crush a quad. It took half a day to build these complicated traps. They were difficult to make and hide along the trails, so the men only made four. Of these large log deadfall traps, two were on the South trail and two on the North trail. Two were pendulum-style, and pulled back behind bushes so as hide them from view. They were designed to swing out from thickets, and crash across the pathway. Violently striking the vehicle broadside. The force drove the rider and machine off an embankment or crushed it against another object like a tree or boulder. The triggers for these devices were heavy-duty to support the weight and were of two-fold staging. The initial trigger was designed to use a trip wire to spring a secondary trigger of much higher tension. The first trigger was used to spring the secondary mechanism. This lets fly the heavy log or, in the case of the dead fall style trap, dropping it onto the unsuspecting victim, crushing him. Bob remained uneasy about using such devices. He warned the group of the potential of killing an innocent person. The women agreed with Bob, but even they felt that the deterrent factor outweighed the possibility of innocent victims. That’s when they all decide to add the words, “Lethal Danger for all who Trespass” under the “No trespassing,” signs. Marlee painted a skull and bones on the signs, as she was a very talented artist. They were black with white lettering, and red flames behind the eyes and heads of the skulls. Marlee had painted four of them using scrap plywood she had found at Bob’s cabin. Murphy had to smile when Marlee showed him, “that will scare off anybody that reads it, Marlee, good job.” She beamed with pride as she showed her sign to her parents and Bob. The next few weeks were surprisingly quiet despite how the group was on-edge. Their feelings were kept hidden from each other, but the feelings were to be expected, given the events that took place just weeks before. The Misty Lake men in their black hoods and leather jackets were a constant irritant in everyone’s thoughts. Marlee was beginning to have nightmares about the men. She would wake up in terror at night, sobbing. That unanswered question was always in the back of everyone’s mind. When or if ever, will they come back to their valley? This no one knew. It was a question that nobody could answer for certain. Both groups decided to rig their cabins with the lethal 7.62 caliber booby traps. They wired them just inside their doorways. The traps were set to shoot two rounds at the door whenever they were pushed open. A deadly greeting without first disarming them. All the trap locations around the valley were shown to the entire group, and for safety they were plotted on Bob’s topographical map for the valley. The door traps were shown to Marlee over and over to be sure she was aware, and whenever they left home, she was the one to set the trap. In this way, she was sure to remember it was engaged. Whenever she found the door locked, she would instantly know to disarm the trap before entering. Life in the coming weeks was hard on the group, the stress was ever present, and for the last few weeks it was unbearable, especially for the women. Murphy decided to have a get-together at Bob’s cabin. It was a beautiful blue summer day, so he proposed that afternoon. He hoped it could relieve the stress that the group had been feeling. Bob and he dug up another cache, and from it they retrieved three bottles of wine and a magnum of dark rum, along with some Holiday treats. The cache had been intended for Christmas fun when Bob had buried it years before, yet he agreed it would be better used and dug up now to boost morale. He had hidden several large jars of pickled eggs and sausage, some popcorn kernels, and chocolates wrapped in foil. Murphy and Bob started preparing for the celebration. They nailed up spruce boughs, pinecones, and berries all around the cabin as decorations, and Lynda tied bundles of wildflowers to the porch posts and leaves. They even tied them to the trees around the clearing. The picnic table was set up with a large centerpiece that Marlee had designed using daisies and whatever she could find in the woods that day. She even made wreaths of daisies for her mother and her to wear as hats. It was a proper pagan festival. The atmosphere of the valley felt bright and cheerful again. Everyone was having a great time decorating. On the menu for the feast, there was roast venison (of course) Indian potatoes with wild greens and edibles from the forest, the pickled eggs were served with smoked beaver tail. The beaver tail was slow cooked and made into pulled BBQ meat and used in homemade rolls Murphy had baked. He was getting really quite good at baking, and cooking now. Bob showed Lynda how to prepare the Beaver Tail. You first start with the large muscle near the base of the tail. This powers the animal’s tail, and for the most part; the mountain men of old considered it the choicest part of the animal. Yes, they ate the tails as well but mostly they were talking about the muscles when they mention Beaver tails. They often spoke about it in old stories of the west. It’s a large-sized muscle that tastes remarkably like beef when slow roasted with salt and pepper and mixed with BBQ sauce until it falls apart. Murphy had even rigged two loudspeakers outside, that he ran wires to on the porch for music. The party was perfect and they played their favorites from the satellite radio system. After the food and festivities wound down that evening, the residents of the tiny valley gathered around the fire pit and enjoyed a quiet evening talking under a clear starry sky, listening to ghost stories and relaxing music from the cabin behind them. They spoke of memories and of the old days before Martial Law, and took turns sharing jokes. Their joy mixed with the music and filled the evening with their laughter that echoed throughout the valley. When the women grew tired, they set up their beds on the cabin floor, and the men drank rum and talked into the wee hours. They laughed and told jokes not fit for the women, and laughed like school kids on an outing. Then the conversation turned to more serious matters. Bob kept repeating the same issue, “We need to see what those bastards are up to at Misty Lake, or none of us will ever get any rest.” Murphy agreed, “We should head straight over the ridge,” he pointed a wobbly finger toward the East ridge, “and I will drop in behind them …to see what they are doing …over there,” he added trying to focus on the faces around the campfire. Obviously, they were feeling the effects of the dark rum, but this did not dissuade them of the seriousness of the topic. They were all good points, and they knew it. “That’s a big hike up there, fellas,” Bob slurred as the rum was taking its toll on him too. “It might take more than a day to get to the other side,” Murphy commented, merely thinking out loud. “Perhaps it would be better to send only one man, to do this,” Murphy said …as he raised his hand pretending as if to volunteer for the assignment. Bob disagreed, “I would be the best choice …I think,” He wobbled his head toward Murphy and Logan… waiting for their agreement. No one could argue with Murphy’s logic, so it was settled, Murphy was to leave in the morning. He would bring just enough food and supplies for a week, and travel dead East over the gap. The mountain pass at the ridge would bring him right above Misty Lake. He was to find a vantage point over the village to observe the comings and goings of the hooded gang, then make his way back and report to the group. “I made it through the swamps of Longview… so I can certainly make it across these mountains,” This was enough for his drunken brain to help him sleep that night. By the time he awoke, it was late morning and his head pounded like tiny hammers in his skull. His very first thought was that he hoped the others didn’t expect him to leave that day for the eastern Valley. If so, he considered, it was going to be a very hard trek. “It’s alive,” whispered Logan with a chuckle. Murphy painfully opened one eye and looked up from his bed, and at his friend drinking a coffee at the kitchen table. He retorted back, “No offense my friend, but you don’t look so good yourself this morning.” The two laughed at their merrymaking last night. Bob opened the cabin door and entered with the large pot of water for the stove. “Oh, you’re up. Let’s have some breakfast and make plans for this recon …eh Murphy. You’ll need some charts, and a small pack, a week’s supply, and a plan.” Bob set the heavy pot of water on the stove with a clunk and poured a cup of hot coffee for himself. All in all, the men were in fine shape by lunchtime, and none of them regretted the celebrating that they had done the night before. It was the break they needed in their routine. The group felt normal, and cohesive again, like one family. They all gathered equipment that Murphy would need for the trek over the mountain. They organized it carefully, and spread it all on the kitchen table before putting it in the pack. The idea was to take everything he might need, and leave whatever he could do without …saving weight. Soon after lunch, they finished packing and devised a rough plan formulating the mission. Murphy was to follow the trail indicated on the topographical map. The map that Bob asked Murphy to guard with his life, for it was the only one he had. The idea was for Murphy to navigate through the pass to the other valley, and once there, sketch whatever he saw on the map. By evening, the recon was completely planned out, and Murphy was to leave the next morning. He hadn’t slept a wink all night, tossing and turning until the wee hours. He wrestled with sleep, and between fits of wakefulness and reoccurring nightmares fighting armies of black hooded figures wielding AK-47s, swinging battle axes, and charging down the mountainside in hordes. He imagined the invasion like some medieval battle, hell-bent on killing everyone in the entire valley, and woke up every twenty minutes until he didn’t dare try to sleep anymore. Finally, he climbed out of his bunk. “There really was no point in lying in bed until daylight,” he thought. It was quite early, and no one else was up except for Murphy. He outside to think, and stepped into the cool night air, quietly closing the door behind him. It was late August, and the sky were filled with stars. All in all, it had been a very favorable summer… with warm temperatures, and sunny skies for the most part. Not too dry, just enough rain to keep the forest green, the garden growing, and the creek running clear. His eyes searched the darkness high above him, looking for the ridge line in the East. It was still too dark to see. Yet, somehow he felt it up there and imagined himself cresting the summit later that day. He sat in his homemade chair on the porch and wrapped a heavy blanket around himself. He sighed from the stress of not sleeping and leaned back closing his eyes. For the first time that evening he fell soundly asleep, not waking until the sun peered over the ridge three hours later. A pair of black-capped chickadees woke him with their namesake chatter. The brash pair were fighting over the contents of a suet feeder that Marlee had made, it hung from the eaves of the cabin over his head. He was the only one up, so he decided to make coffee while getting his mind ready for his trek. Bob woke next, as soon as Murphy entered the cabin, and Lynda woke next after the aroma of freshly brewed coffee filled the room. “You ready for this Murphy,” Bob asked as he poured his coffee. “I think so. The initial climb is the difficult part. I’m sure I can stay out of harm’s way, using that spotting scope… I’ll be fine,” he smiled meekly at Bob feigning a look of confidence. Both men sat quietly drinking their coffee. Nothing more needed to be said as they sat in silence. “Oh, okay,” she said not believing him, “I just wanted to be sure you were all set. We wouldn’t want to lose ya, Murphy. Who, would teach us about baking bread, and who would feed Bob here?” She smiled, and squeezed Murphy’s hand, as Bob and she laughed. Logan loudly comment from sleeping on the floor, using a normal tone as apparently whispering was no longer needed, “Sure he’s all set, nothing to worry about. It’s really quite safe.” Murphy wasn’t sure if Logan believed that or was just trying to comfort his wife, but it felt reassuring nevertheless, and Murphy relaxed and sipped his coffee. He was now ready, standing outside with his backpack on and his rifle neatly tucked alongside the frame. Everyone was awake, including Marlee. The gang all wanted to see him off. He took his first step, it landed firmly on the top stair. He remembered, months ago, the stumble he took from the North trail that broke his leg. It had healed well, and only gave him problems when it rained. He paused, considering the old injury, still looking down at his boot and grinning to himself. He clattered down the stairs like a school kid and headed straight to the creek crossing. “Good luck… be safe… be careful,” the voices called after him. Once he reached the creek he felt invigorated, the lightness of the pack, the bright morning, the lack of confidence that was now gone. He felt good …he felt brave for taking on the mission. At the creek crossing while balancing expertly on the large log he stepped lively across it in three giant leaps like he was sixteen again. The last thing he heard before entering the woods was Marlee calling, “See you later, alligator.” Then silence, as the dense forest swallowed him up. There was no real trail leading straight up the mountain, and any trails he found soon died out. It was mostly bushwhacking and straight uphill climbing. It wasn’t long before the steady climb began to take its toll on Murphy’s legs. The pack was made purposely light, however, it was still hard to climb without losing one’s breath. It may have been the altitude or simply the climb but he decided to take a break. He was halfway from the summit, and the altitude at the gap was approximately 2000′ above the valley floor. The slope was a constant 60 degrees, too steep to stand most of the times, but not steep enough to crawl. The sun had finally crested the ridge, and its rays were beginning to shine on the trees below him. He knew that if he wanted to be comfortable while hiking, he should make the gap before the sun was overhead. Therefore, he couldn’t rest anywhere for long. He just wanted to take a good look at the valley from this height. It had been so long since he last saw it so many months ago. He sat for just a few minutes before he continued on. Below him, the valley was lush and green. All of it, except for the meadows that were beginning to brown from the summer sun. Across the valley …way above the ridge soared two Eagles. Murphy watched them for ten minutes or more, as they danced and swirled in the blue sky. The birds never once flapped a wing beat. They simply glided on the thermals of the warmer rising air, and slowly sailed off toward the west until they vanished into the distance. Murphy thought to himself, “what a beautiful valley,” it is well worth protecting it from those punks from Misty Lake. He pushed himself from the ground with a walking stick that he had scavenged along the way, and said: “Well I’d better keep moving.” He got up from the spot, “This ain’t going to get done without a little effort,” he told himself as he rose. By mid-afternoon, he had finally made the west end of the gap that led to the divide over the top. He hoped to camp at the summit that night, and make his way to the other side next morning. He had stripped down to his t-shirt at noon but now thought it best to layer back up again, as the temperatures dropped with the altitude and the sunset. As soon as he stopped to redress, a small gang of elks stepped out on the trail in front of him. Three cows, two yearlings, and a calf. They stared at Murphy for a moment blinking, and then hurried off around a stand of trees for cover. Probably making their way into the valley behind him. Murphy could see how Bob had gotten so attached to this world and his Grandfather’s camp. It was heaven on earth. He hurried along the rest of the trail until he crossed into the Misty Lake Valley and found a decent spot to camp for the night. He chose it because his fire would stay hidden from below behind a large outcrop of granite. That evening, the shadows from his fire loomed large and menacing on the dark gray rock. He decided not to cook that evening, and continued to snack on what he had been eating all day during the climb. He carved another large piece of deer salami, and a large chunk of home-made bread with some dipping oil. He could only imagine how some cheese and wine would taste with his meal. “Beggars can’t be choosy,” he said to himself and kicked at the tiny fire making sparks fly up into the air. After his meal, he unrolled his sleeping bag and moved beside the smoldering coals for warmth. In no time at all, Murphy fell fast asleep. He had no dreams that he could recall later, and no nightmares, in fact, he slept completely at peace with the world. The outdoors agreed with him now. He had forgotten how much he loved it when he was young. Murphy believed that most people forget how to bond with nature, and that is truly what is missing in their lives. Most think that is more stuff that will make them happy, but Murphy now knew what it was. By morning, the frost had formed on the outside of his sleeping bag, and the fire had died out. He gathered his belongings and hid the fire. He hit the trail before breakfast. Choosing to chew some jerky as he hiked along. According to the map, if he stayed near the ridge line and headed south, paralleling it, he would come to an abutment. A huge granite slab that stuck out above the Misty Lake Village. The topographical map showed it as a perfect vantage point to watch over the entire village below. It took Murphy over an hour to get to the outcrop, and he finally made his way to the very edge of it. He scanned the valley before him. He could see for miles over the forested valley, and just below him lay a tiny lake surrounded by cottages. Running behind the cottages was a single road that wrapped the circumference of the lake. The Misty Lake Resort had a general store a boat launch and nothing more, just a string of cottages surrounding a body of water. This was the Misty Lake village. The village that the hooded gang of miscreants had taken over as their own. According to the Granvilles, Logan, and Lynda claimed they now controlled the entire resort. They claimed it all started with just a few young men who had broken into a single cottage at the north end of the lake. The residents of the resort tried to get the authorities to come and chase them out, but the lockdown had prevented any officers for following up such minor offenses. Soon, the lake shore hooligans realized they could get away with what they wanted, and began to call their buddies. As word got out, in less than two weeks, many more cottages fell to the wrath of these punks. It was still early morning, and Murphy couldn’t see any activity other than a small pack of dogs roaming the roadway. The animals stopped at every garbage bin searching for food. He pulled out the spotting scope from his pack and scanned the shoreline of the lake. The first thing he noticed was the destruction of many of the boathouses, three burnt cottages, and garbage everywhere. The cottages had been burned to their foundations, along with several cars that had been turned over then burned to their rims. Several ATVs could be seen in the shallow parts of the lake, and he saw two sunken boats bobbing in the waves. “What a shame,” he thought. A dozen ravens, magpies, and as many crows could be seen scavenging food on picnic tables in the yards of the cottages and even more circling above the lake. So many birds were there that it looked surreal, like some sort of nightmare had unfolded here. Shockingly, he saw several tall pines that had been torched to their upper branches. Obviously set ablaze for the fun of watching them incinerate. Murphy considered how lucky it hadn’t been a dry year. Otherwise, these morons would have started a forest fire, and burned down the entire valley. He watched the village until the sun came up, and managed, only to see an occasional person walking from one cottage to the next; once several children were observed motoring around on quads. Murphy couldn’t imagine children growing up in a place like this with these people. He felt sorry for the kids. He suddenly wondered if the man Logan had shot might have been a parent to one of these youths. What had once been a middle-class resort, had now been reduced to a ghost town in less than two months. Murphy could see there was nothing organized about these delinquents and their methods. In fact, he doubted they would last until fall. They were just punks, bent on destroying and looting everything they could find. He wondered how dangerous they would be when the free stuff ran out and they started to get hungry. That evening, as the sun sank below the western horizon, Murphy watched below, as the miscreants slowly came out to revel in the neighborhood. It all started with just three bonfires and grew in symphony with loud music, and harsh voices, coming from everywhere as if some kind of competition was taking place. The unnatural din of the festivities filled the valley, upsetting its natural order. The noise seemed to spawn hundreds of the hooded beings that poured from the cottages like ants from a nest disturbed by some unseen hand. They filed out howling and shooting their guns into the night sky, and as far as Murphy could see, there were over two hundred of the revelers in all. The festivities stormed well into the next morning. All the while, the mob drove about on quads, motocross bikes, and 4×4 vehicles tearing up everything they cared to, spinning wheels and jumping or crashing their vehicles all over the village. Murphy could hear cheering from one group, as a lone man drove an ATV straight into one of the bonfires, they all shouted and stepped back as the gas tank exploded, and cheered some more. Murphy then witnessed as two towering old pine trees were set ablaze at midnight. They lit them from their base with diesel fuel, watching the flames run up the trunks until the great trees lit up the entire valley, bursting into flame, yet only for a few moments as the sparks billowed and swirled with tendrils rising over a hundred feet above their branches, licking the night’s sky. Murphy considered how easily he had come over the mountain, and hoped that none of these idiots would ever make the effort to venture into their valley. Either way, they were certainly a dangerous bunch. He decided to stay one more day and watch how they acted before heading back. He saw no point in wasting a week up here. He considered that, unless he could come up with some other purpose for being here, his mission was over. He sketched what he had learned on the map, noting the location of the fuel tanks which he assumed would be empty, and the main cottage at the center of the party. The large log cottage on the far side of the lake. This seemed to be the central place for the group’s gathering. Murphy figured the head punk was located there. He decided to stay one more night and then move back on down the mountain. That next evening was more of the same debauchery, vandalism, and mayhem, coupled with the pointless merriment of drunken fools. Murphy considered returning with Bob and Logan to run these morons out of the valley. But he knew in the back of his mind that they were too few, and that they would only move on to someone else’s resort or village, and cause the same problems. He considered that they were perhaps just as well off here, where they were at least contained in the valley. Here they could do no more damage if left alone. Even if they started a forest fire, there was a good chance it would stay contained in their valley, while eventually burning itself out against the highway to the east, and held back by the prevailing winds, and the mountain slope of the west side. What a sad end to such a beautiful slice of heaven. The following afternoon, Murphy decided he had seen enough, he packed up and made his way back down the mountain. The trip down was much more leisurely than the hike up. The three days on the mountain were sunny and bright. If not for the gang in the other valley, it would have been a fantastic adventure. Bob called the Granvilles with the VHF radio, and everyone met at the cabin. Murphy had to explain the whole trip once again, but he didn’t mind after getting a few beers in him. The group was delighted to hear that the threat of the Misty Lake gang was less than eminent. They still feared the men and worried about them invading their little slice of heaven, knowing it was so easy to cross the mountain that separated the two valleys. The question was now what will happen when the easy pickings run out at Misty Lake? Will they risk invading their valley for supplies after losing one of their men in the ambush? It was mid-September by the time the five residents of the tiny valley got back to normal. The group eventually relaxed. It was a magnificent Indian summer bursting beneath blue skies, with fantastic colors amidst the evergreens, were amber and scarlet leaves blazing like fire, and flocks of geese flying south in their usual formation, making their way to those winter feeding grounds. The next afternoon, Bob and Murphy agreed to visit the Granvilles and take a secret look at their food stores. They didn’t want to embarrass Logan in front of his family, they just wanted to make sure the family had enough supplies for winter. Earlier, Murphy was digging around under the shed roof at the back of the cabin, he discovered a half-dozen large gallon glass jars. He decided to load up the jars along with a few smaller ones, and deliver them to Lynda for food canning. Although the jars were not re-sealable, they could be sealed with paraffin wax, and stored with the lids on them to protect the wax seals. They were ideal for family sized quantities, he also threw in a dozen empty jars of various sizes. Lynda was delighted to have another way of storing her winter supply of canned goods. She took the glass jars and cooked all day. Driving everyone out of the tiny cabin, with her frantic brewing of stews, soups, and canned wild edibles, cramming each jar full for the long winter. The tiny cabin was like a sauna inside from warming the pressure cooker on the hot stove. Both cabins were now ready for the coming season. It was the first week of September and, normally, Marlee would be heading back to school, so it was decided that the three adults would supply Marlee with an education. Lynda had been a teacher in the past so her job was certain, math, English, and social sciences. Logan taught her business, Murphy taught the girl accounting, and economics, while Bob taught Marlee her favorite subject, hands-on wilderness survival, and wildlife conservation. The adults taught class using an old rusty plate steel, and a piece of soapstone as the chalk, they washed off the lesson with a wet cloth. This added to the rust and made the rough surface that the soapstone could write on. By October, the snow began to fly. Bob had an idea: Marlee and he would spend the next week making five pairs of snowshoes using the old Algonquin Indian style as a pattern. They were made of straight grained ash for the frames, and webbed with long strips of rawhide from Granville’s deer. Bob showed the young Marlee how to make the long pieces of the hide, starting with a circle and using a razor stuck next to a nail in a board or log, one could pull the circle of hide against the razor as the nail kept it even and from running astray, and unwind pieces as long as you like. With a little practice, Marlee was able to strip off long twenty-foot pieces of hide a quarter inch thick. Next, they soaked the hide in warm salted water to soften it and then used it to weave the webbing needed for the snowshoes. They dried it over a smudge fire that cured the rawhide, this along with the salt soaking preserved it for a lifetime. It dried and shrank into place as tight as a drum holding everything together without any nails, except at the pointed tips and trailing ends. Here, the nails were peened over holding tiny pieces of tin as washers in place. The Algonquin style was perfect for making your way through the bush as the leading end is curved upward, and pointed. Not rounded like conventional snowshoes. This style allowed a person to poke their way through tangles of brush without getting hung up by the closeness of the bushes. Eventually, the two got so proficient at making them, they could assemble a pair of shoes in a day once the frames were steamed and set. That evening, Bob and Murphy were invited down to Granville’s cabin for supper. As with most evenings, they sat around the stove, having coffee, and talked until midnight. “How do you propose we do that,” Murphy asked. “Hey, that might work,” Murphy commented a bit too loudly. “Shhhh… Marlee is asleep,” Logan said quelling Murphy’s excitement. “Sorry …How about we give it a try in the morning,” he whispered back. The men clinked their coffee mugs together, and stared at the open door of the camp stove and watched the flames. The next day Bob and Murphy came down and met Logan and Marlee at the Granville cabin. Marlee wanted to come, and no one could see any reason why not. Besides’ it gave Bob a chance to teach the girl about felling trees, limbing them, and lashing technique. “What I hope, is for the snow to come back again and covers these tracks soon,” grumbled Bob. “I was thinking the same thing,” said Logan. “Oh we just don’t want anyone figuring out how we did this that’s all,” he smiled over his shoulder at the young girl. Murphy glanced at Bob with a look of concern. “That would definitely not be good,” he quietly whispered to himself so the girl couldn’t hear. Bob, and Murphy suddenly coughed on what the answer might be. “Oh yeah,” cried Bob, “That’s right, better get going. See you guys.” The two chicken men hurried off before they got stuck in the middle of the family squabble about to take place. The next morning, Bob woke, and grabbed the water pot from the stove as usual, and headed to the creek. He quietly left the cabin and closed the door behind him and, as he turned, he came face to face with a bearded man all clad in buckskins, sitting astride a painted horse. He wore a large fur hat and carried a Winchester lever action across his chest cradle in one arm. Bob froze mid-turn, still bent down with the cabin door handle in his hand, his jaw dropped, not truly believing what he was looking at. The strange being spoke in a deep voice, “Sorry I didn’t mean to scare you,” he said, as the painted horse pawed at the ground. Love the story and the premise…keep ’em coming! LOVE THE STORIES,CAN’T WAIT FOR THE NEXT ONE. CAN’T WAIT FOR THE PREPPERS ON THE RUN STORIES. I HOPE BOB GOES TO THE NEXT VALLEY AN WOOPES SOME. AS WILDCARD609 SAID…KEEP ‘EM COMING. Dang….that went quick. I’m not worried ’bout Davey Crockett showing up….I’m betting he will be instrumental somehow in dealing with the hoodlums at Misty Lake. Just a guess…..
Why are the time stamps on comments so far off. Curious….mine showed 3:37pm, it’s only 9:37am….unless this server is in Europe maybe? You’re right, sorry for catching that. The server is in Phoenix, I changed the WordPress date to reflect that, however I’m not sure that this will reflect in older comments.. So far, quite good. the “willing suspension of disbelief” is not difficult at all; characterizations are adequate although a bit thin. I look forward to the unfolding story. Nice work Jack, I’ve been enjoying these. Can’t wait for the next part! Excellent when is the next part due?. Can not wait. Jack you are an excellent writer, very articulate and you know how to draw the reader into the story. I am so thrilled that there is more to come. Outstanding!! Very good story telling, very insightful, And inspiring to get every detail of prepping in order. I read every chapter without letup. Enjoyed every minute of it and hope to see more very VERY soon. Thanks so much! 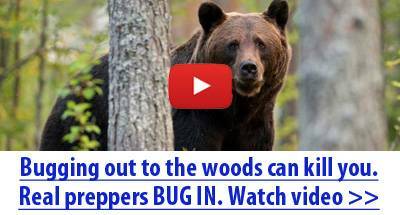 Great mixing of survival skills education and mental preparation for how to handle threats. Thank you for the reminder to step up my prepping pace. I like the story line but come on does he have a WallMart with some of the stuff he is bringing out.